so....i know everyone says it but....inspiration comes from the darndest places. i have a confession. i love flea markets, garage sales, estate sales. my heart skips a beat whenever i see a hand painted piece of cardboard taped on a street corner as it gleefully shouts to me"garage sale! you must come and find treasure...NOW!" i know...i know...im silly but i love them so. i wont bore you with all the reasons but i'll share the most important reason for the time being... cause i found treasure...and by treasure i mean this amazing frame. i've had this treasure for over 5 years now and it's just been patiently sitting and waiting for me to do something with it and finally...i did something! i drew a pony! 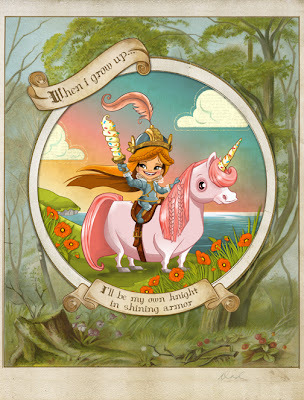 When i grow up ...I'll be my own knight in shining armor. this one goes out to all the ladies. (please imagine me pointing at you and cheesily winking). don't be a damsel in distress. go find your own pink unicorn pony and grab your trustiest vanilla cono sword and make things happen. happy things. the best of the things. the end. ps. the best thing about the treasure..the word "Dad" written in cursive on the bottom of the frame. isn't it the sweetest?